Green Lantern #76-start of the classic run by neal adams and denny o'neil that redefined comics and revitalized the dying industry. It introduced real social problems the heroes had to confront and is the catalyst that has evolved comics to what we all know and love today. It may seem tame by todays standards but this was groundbreaking at the time. Has some staple rust, spine damage with staple rust, and a light stain on the cover. Its complete and lays flat with bright color. Please see the pics to judge condition for yourself. Thanks for looking and please check out my other auctions for more great comics! All Green Lantern reprints: "The Challenge From 5700 A.D.!". Captain Marvel stars in a one-page Hostess ad, "The Cup Cake Caper.". New Mike Grell cover. GREEN LANTERN 76-89 part set! Neal Adams art with Green Arrow DC 1968-72 VG-VF. 76 VG-F. 84 VG TOP STAPLE PULL. 83 F 2 Center Folds LOOSE. 78 F CF LOOSE. Green Lantern. Guide Value. Send us a note to split a lot of comics if there is a single book or selection of books you would rather have. It is marked DO NOT BEND. Green Lantern 76 CGC 8.0 with Off-White to White Pages. 1970 Green Lantern 76 CGC 8.5. Green Lantern/Green Arrow stories begin. CGC cert #0227157002. Published by DC Comics from 1968 until 1977, this was an oversized 29 issue series filled with a variety of reprints and new stories. The book is in VF 8.5 condition. The book pictured is what you receive. Classic Neal Adams signed Cover ~ Scarce in any Grade! Signed by Neal Adams!! 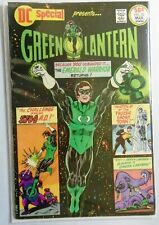 CGC 4.5 ~ Green Arrow in Classic Green Lantern Neal Adams Classic Cool Cover & art! ~ This Legendary classic has Off-white to White pages and a crack-free CGC case. #107 -1978 - F Has a hard crease on the right hand upper corner of the cover with color loss. #105 -1978 - VF - Has several creases on lower right hand corner of front cover with color loss. #104 - 1978 -G - Wear on the front cover with 1 1/2" tear on right hand side of front cover. Green Lantern 1976 #92 Fine/Very Fine (includes a bag & board). You will receive the. This lot includes Green Lantern (1st series) #90, 91, 93, 97, 98, 99, 100, 101, 104, 105, 120 and 121 featuring great Green Lantern/Green Arrow stories as told by Denny O'Neil, Mike Grell and Alex Saviuk! EDITORIAL NOVARO 1971 . CGC 6.0 1971. QUALIFIED GRADE: MISSING 10TH PAGE STORY UNAFFECTED . B ATMAN . DC Green Lantern #76. PGX 7.5 #501251048 OW/W comic was encased in June 2017 and the case is in excellent shape. GREEN LANTERN #90 [1976 VG+] "NO EVIL SHALL ESCAPE MY SIGHT!" GREEN LANTERN, 1976>. The artwork pictured are all one of kind originals unless otherwise described. This is a Green Lantern #184. This comic is in Very Fine Condition. This is a Green Lantern #134. This comic is in Very Fine Condition. This is a Green Lantern #191. This comic is in Very Fine Condition. This is a Green Lantern #189. This comic is in Very Fine Minus Condition. This is a Green Lantern #190. This comic is in Very Fine Minus Condition. Classic art from Neal Adams highlights this key issue that features the beginning of the Green Lantern, Green Arrow stories. Green Lantern 76 (April 1970). CGC Graded 9.2, Off-White to White Pages. The case is intact. This is a Green Lantern #186. This comic is in Very Fine Condition. This is a Green Lantern #180. This comic is in Very Fine Plus Condition. This is a Green Lantern #179. This comic is in Very Fine Plus Condition. This is a Green Lantern #166. This comic is in Very Fine Plus Condition. This is a Green Lantern #163. This comic is in Very Fine Plus Condition. This is a Green Lantern #178. This comic is in Very Fine Plus Condition. This is a Green Lantern #177. This comic is in Very Fine Plus Condition. This is a Green Lantern #170. This comic is in Very Fine Plus Condition. This is a Green Lantern #168. This comic is in Very Fine Plus Condition. This is a Green Lantern #167. This comic is in Very Fine Plus Condition. This is a Green Lantern #164. This comic is in Very Fine Minus Condition. This is a Green Lantern #157. This comic is in Very Fine Plus Condition. This is a Green Lantern #169. This comic is in Very Fine Plus Condition. GREEN LANTERN – 2. · 134 book lot. · This is a near complete run of the series after its re-introduction in 1976 [12 years]. · Photos of several of the earliest issues in the lot are provided. · Comic book grading is subjective. This is a Green Lantern #176. This comic is in Very Fine Plus Condition. This is a Green Lantern #187. This comic is in Very Fine Condition. This is a Green Lantern #138. This comic is in Very Fine Minus Condition. This is a Green Lantern #125. This comic is in Very Fine/Near Mint Condition. This is a Green Lantern #183. This comic is in Very Fine Minus Condition. NEAL ADAMS & DENNY O’NEIL . GL # 7 6 - CGC- SS 7. GL # 7 7 - CGC- SS 8. GL # 7 8 - CGC- SS 8. GL # 7 9 - CGC- SS 7. GL # 8 0 - CGC- SS 8. GL # 8 1 - CGC- SS 7. GL # 8 2 - CGC- SS 9. GREEN LANTERN #76 by DENNY O'NEIL & NEAL ADAMS. ACTION COMICS #252 (1st APP OF SUPERGIRL) by CURT SWAN. THIS SET CONSISTS OF HOUSE OF SECRETS #92 (1st APP OF SWAMP THING) by LEN WEIN & BERNIE WRIGHTSON.